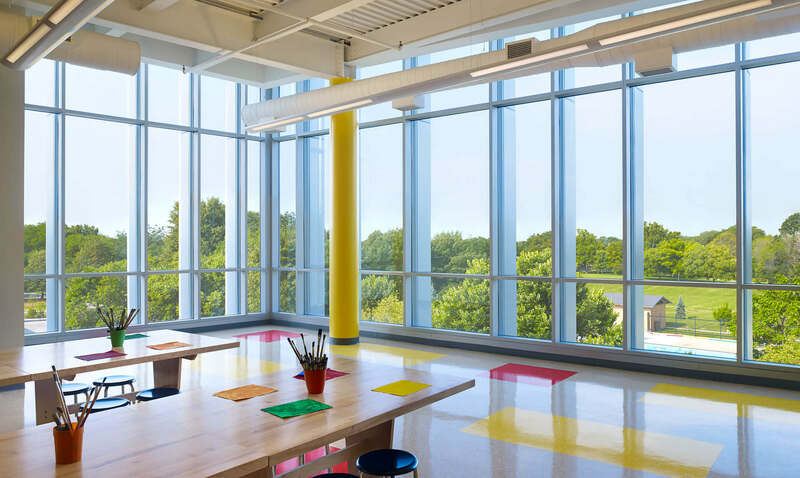 Under “Modern Schools Across Chicago,” the Public Building Commission (PBC), has retained ESA for the design and construction of a new academic annex to Nathan Hale school building. The 41,300 sf, three story annex will be connected to the existing elementary school at its north end. Built in the mid-twentieth century the existing building has modest Art Deco details. The Annex design replicates and adapts this detailing language and uses aluminum panels to bring accents that express the addition’s contemporary origin. These panels are used to clad a cantilevered bay at the art classroom that captures ample daylight and affords views of the adjacent park. The Annex, which will serve 360 students will include 11 standard classrooms, a new computer classroom, a new art classroom, student pull-out rooms, business offices, and a new commercial kitchen with student dining facilities. The project scope also includes acoustical improvements in the auditorium. To make the school safer, stronger, more technologically adaptable and more environmentally friendly, the Annex features, a new fire alarm system, programmable HVAC systems, upgrades to the IT infrastructure, use of low emitting building materials and security cameras that can be linked to the city’s Office of Emergency Management and Communications. The site development will also include parking improvements, an enclosure for the trash/recycling and conversion of existing asphalt paving to new open green space. The project achieved LEED Gold certification.